Article tiré du journal The Wall Street Journal. Murray Grey has a beef with traditional ranching methods. Each year in punishing heat, Mr. Grey has mounted a horse to round up some 5,000 cattle across a swath of the Australian Outback more than twice the size of New York City. Camping under the stars would be romantic if not for the buzzing of bush flies and the threat posed by venomous reptiles. The cattle often lost weight on the trek back to pasture after being weighed, costing Mr. Grey thousands of dollars in profit. Recently, the 30-year-old cowboy has been trying something different. He has swapped the saddle for the sofa, and his bullwhip for a mobile phone. The image of the whip-cracking, tobacco-chewing cowboy made famous by actors such as John Wayne is under attack from a very modern foe: technology. Mr. Grey and other ranchers across Outback Australia are part of a trial that uses data collected by National Aeronautics and Space Administration satellites to help manage their herds. Australian farms are so big, and so remote, that ranchers rarely travel out to the far reaches of their property. They see only about 2% of their landholdings on a regular basis. The benefit of using satellite and other data collected remotely is that ranchers are able to assess cattle as they roam the scrub. Also appealing to ranchers: the prospect of becoming a little less saddle sore. Nowadays, the 5,000-cattle ranch, which once employed some 20 people, is a two-person team: 43-year-old Ben Hayes and his wife Nicole, 42. Helicopters have long since replaced horses as a way to round up cattle and even they could be on the way out after a successful trial of the latest in farming technology. 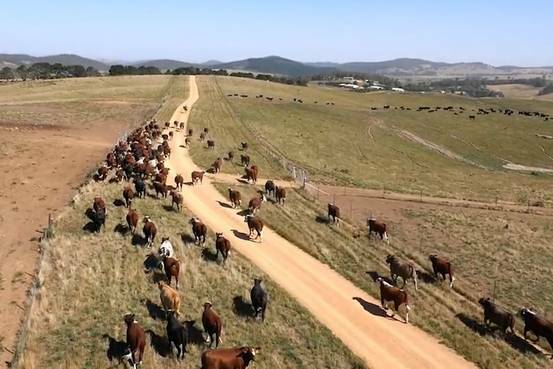 The Outback project is the first in the world to rely only on technology to monitor beef cattle, and in such remote areas, according to a state government agency which is running the five ranch trial. Satellites take images of every 820 square feet of the ranches daily. On the ground, automatic weighing stations measure cattle each time they come to the water trough. The data are crunched by a computer program and sent to farmers. They can then make decisions ranging from whether there is sufficient feed for grazing to exactly when each animal meets the ideal weight for market. Mrs. Hayes doesn’t think the pioneers who first tamed the ranch would turn in their graves at the tech-savvy shift. In an interview several years ago, Ben’s grandfather was asked what it was like to farm in the “good old days.” His response? Modern conveniences like air conditioning, electricity and a refrigerator, meant he was living “the good old days,” Mrs. Hayes recalls. Not everyone is happy, though. He also sheepishly admits to sneaking a look on his laptop to see how his cattle were faring in 2013 while he was honeymooning in Ireland. Harnessing the technology hasn’t been without problems. Temperatures topping 110 degrees can make solar panels used to power the scales and electronic ear-tag sensors malfunction. Dust storms often blanket the red-clay landscape, coating the face of the panels. Flocks of cockatoos—a native parrot—chew through cables that connect the equipment. Convincing many ranchers that the technology passes muster is perhaps the hardest job of all, says Sally Leigo, research leader of the Precision Pastoral Management Tools Project, a state government initiative aimed at encouraging farmers to use data collected remotely. At first, some ranchers didn’t believe cattle used to roaming tracts of land without human contact could master the weighing machines, which require them to walk through a narrow gate to access the water trough, she said. What do the animals think? Without humans, their noisy trucks and their horses, they “behave like a bunch of old dairy cows,” nosing their way to the trough one after the other, Ms. Leigo says. Australia ranks behind only Brazil among the world’s biggest exporters of beef, and lawmakers and farmers think the country could become a food bowl for Asia where people are increasingly adding protein to their diets. However, the Outback’s fragile environment has often resisted efforts to drive up livestock and crop yields. Much of northern Australia is vulnerable to drought. A dry spell that spanned 2001 to 2009 forced many ranchers off the land for good, and contributed to farm debts rising. Experts say technology may help conquer the barren Outback landscape that in places looks more like Mars than Earth. Mr. Grey’s sprawling half-a-million acre ranch in Western Australia state is located 2-1/2-hours from the closest town, including more than 50 miles along unpaved roads. Fresh provisions arrive once a week by mail truck. What will cowboys of the future look like if farms can be managed at the click of a mouse? There are some jobs that can’t be supplanted by computers, Mr. Grey said one recent morning as he headed out to rake the manure from his cattle trailers.